The W270 SottoZero Serie II is a W-speed rated performance winter tyre developed for the drivers of super sports performance vehicles who do not wish to compromise during winter conditions. SottoZero Serie II tires are designed not just as snow tyres, but also to provide traction and handling in the range of dry, wet and cold conditions experienced during the British winter. 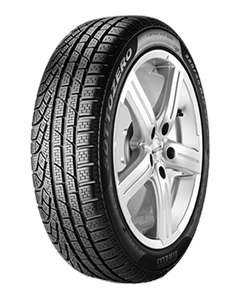 W270 SottoZero Serie II tyres use dual tread compounds featuring new polymers and mixing processes eliminating aromatic oils making them more ecologically friendly. A softer external compound improves traction in cold winter conditions while a firmer internal compound improves high-speed stability and durability. Improved traction in winter's near freezing and lower temperatures is achieved through Pirelli's Temperature Dynamic Compound technology optimising the compounds for wet and icy surfaces. Lateral and longitudinal stability are increased while providing more biting edges to increase snow traction by the tread blocks use of Pirelli's Interactive Brickwork Siping, where the sipes create a brickwork pattern. W270 SottoZero Serie II tyres feature the internal structure found in the P Zero, including twin steel belts reinforced by spirally wrapped polyamide to enhance thermal stability and make the tyres less sensitive to change in road and air temperature. Sorry, we currently do not have any tyres with the W270 Sottozero 2 pattern in stock.